Firstly add all ingredients to list. And preheated oven to 350 degrees F (175 degrees C). Grease and flour a 9x13 inch pan. Then in a large bowl, mix together cake mix, eggs, oil, water and coconut flavoring. Beat for 2 minutes and pour into 9 x 13 inch pan. Bake for 30 minutes, or until a toothpick inserted into the cake comes out clean. 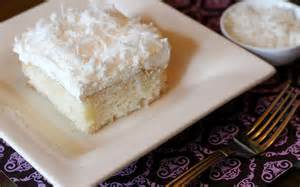 Just in a medium bowl, combine coconut cream with sweetened condensed milk and stir until smooth. When cake comes out of the oven, poke holes into it in even rows using a large fork or chopsticks. Pour milk mixture over, allowing it to soak into the cake. Refrigerate for several hours or overnight. Finally in a large bowl, whisk cream until soft peaks form. Add sugar and continue whipping until stiff. Spread over cooled cake. Sprinkle top with flaked coconut.